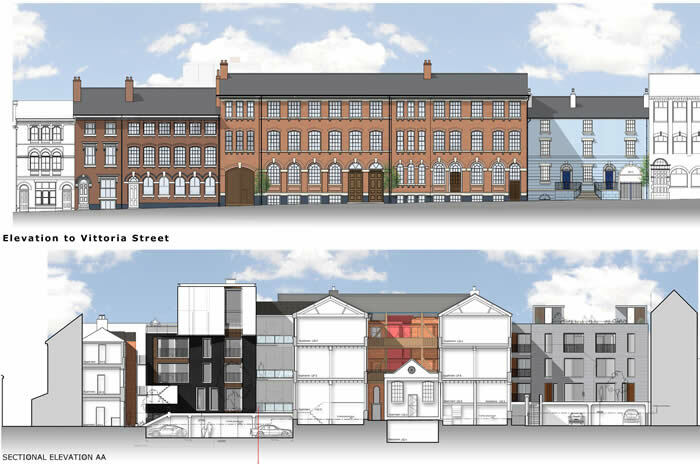 PCPT Architects have lodged planning and listed building consent applications for Unity and the properties on either side: the listed Vittoria Works and two original street houses from the mid 1850’s. All together over 4,000sq. metres of prestigious loft-style accommodation will be provided around two main courtyards. It is hoped that the project will be one of the first beneficiaries of the Jewellery Quarter Development Trust’s Townscape Heritage initiative funded by the Heritage Lottery Fund which was announced just a few days ago. Our client is Stonehurst Estates who come to the city with an track record of work on city centre conversions of factories for residential use.